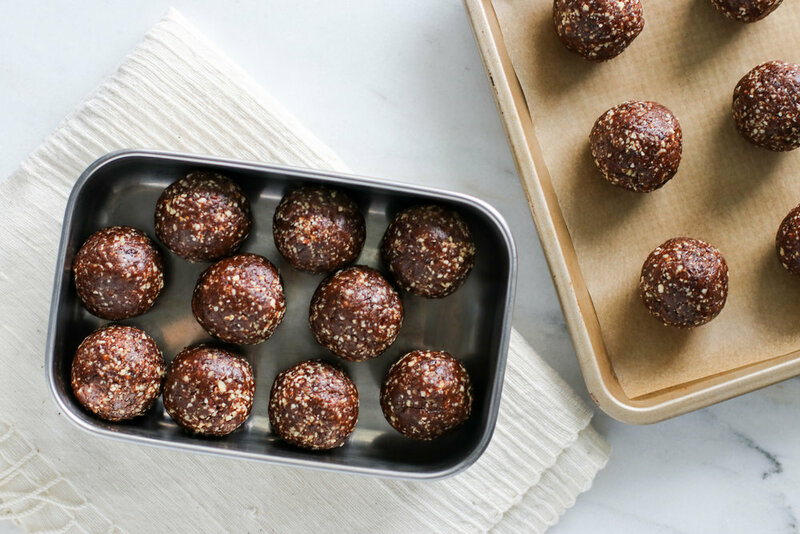 Cinnamon Raisin Hazelnut Energy Bites — Erin Parekh | Live Well, Simply. Okay, yes...another energy bite recipes. But I just love them so! And apparently you all do too. I served these at my table at Hamptons Wellness week the other weekend and they were a HUGE it. To the point where children ran up for thirds and their moms were asking where they could buy them...one day...maybe...! I love the depth that the raisins give these bites and there's the tiniest hint of cacao powder too. All rounded out with just enough cinnamon. They're perfectly balanced. I'm still working my way through the week's leftovers in the freezer, but you better believe I'll be making another batch as soon as their out (which is going to be very soon). Now it's your turn! Try them out and #erinparekh to let me know what you think. Preheat oven to 350 degrees. Add nuts to sheet pan and toast for 5-6 minutes until just golden and fragrant. Watch them closely to prevent burning. Add toasted nuts to the bowl of a food processor and pulse briefly to break down. Add remaining ingredients and pulse another 60 seconds or so until a dough forms and sticks together when pressed between your fingers. It should still have some texture. Roll dough into heaping tablespoon sized balls (or smaller for kid sized hands). Chill in a single layer for one hour to firm up. Store in an airtight container in the fridge for several weeks or in the freezer for 2-3 months. *If your dates are hard, soak them in hot water for 5 minutes. Drain well and continue with recipes.